(1989–1993), overseeing the military invasion of Panama (1989) and the first Persian Gulf War (1990–1991). 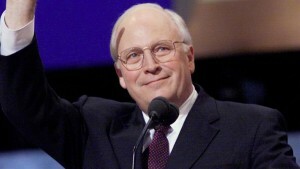 As vice president in the administration (2001– ) of George W. Bush, Cheney was popularly perceived as a shadow president, who wielded unprecedented decisionmaking power. Many saw Cheney—not Bush—as the chief architect of the “war on terror” that followed the attacks of September 11, 2001, and the prime instigator of Operation Iraqi Freedom.